Treasure. A developer long known for cult favorites, was one of the kings of shmups. Unsung kings. By the time the Super NES, and Genesis came around, everyone knew of heavy hitters. Gradius. R-Type. Raiden. Contra. But Treasure put out many great games that were under the radar at release, but became sought after later. Nowhere was this more true than on the Genesis. Gunstar Heroes, Dynamite Headdy, and Alien Soldier went on to be cult classics. Even today they’re popular enough that a loose copy of Gunstar Heroes goes for as much as a newly shrink wrapped release. After the Genesis, Treasure would make games for Saturn, Dreamcast, and even Sega’s rival Nintendo. 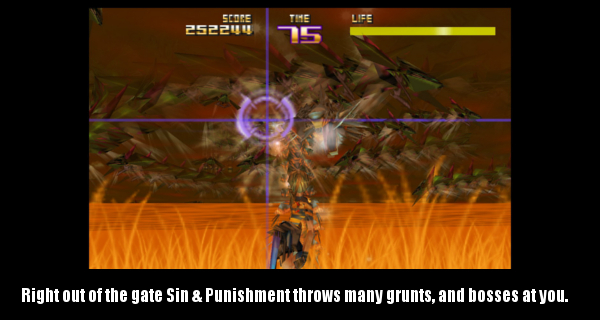 Sin & Punishment is not only one of the best rail shooters on the Nintendo 64, it’s one of the best you will ever play. PROS: Fast, smooth game play. High, rewarding challenge. CONS: Difficulty may turn off some. MOD: It was a Japanese only release. But it is on the US Wii Shop Channel. Sin & Punishment never made it outside of Japan. It was released in 2000 at the very end of the Nintendo 64’s lifespan. Though acclaimed, Nintendo never brought it to North America. It was intended to be released here, but due to the Nintendo 64’s decline by that point it wasn’t. If you’re really worried you won’t be able to navigate the game, you shouldn’t fret. You don’t have to know a single word of Japanese. Though you may have to experiment with the main menus to get into the game. Something that takes all of five minutes. Similar to the Super NES, The Nintendo 64 also had different tab placements in the system to prevent games being inserted from other regions. If you don’t mind tinkering with some pliers, you can remove them. This will make your N64 capable of running imported cartridges. For those unwilling, or unable to mod their console, you can also use a Game shark as a pass through device. Or if you don’t want to go through those steps, and you own a Wii, there’s another option. As of this writing Nintendo’s Wii Shop Channel is still around. While you may not be able to play Wii games online, you can still buy them. The Virtual Console section is no exception. So you can skip all of the importing, and modifying should you desire.Be aware though, if you choose to play the game on the Wii (or Wii U in Wii mode), you will need to invest in a classic controller attachment if you haven’t already. With the lengthy introduction out of the way, I’ll talk about the game. Sin & Punishment takes place in a dystopian future. There is widespread famine, and so new creatures are cultivated for food in Japan. But the creatures mutate into deadlier beings before turning on the populace. A military group called the Armed Volunteers steps in to fight the creatures, as well as another one called the Saviors. The Saviors oppose both the creatures, and the Armed Volunteers. The setup starts out like a standard action movie, but things become more, and more bizarre as you play through the campaign. The three main characters are Aichi, Airan, and Saki. Throughout the game there are in-game cut scenes that give a bit of back story for the characters, and why they’re fighting the Armed Volunteers. Without giving anything away, there is an ulterior plot that is uncovered later. Things do get pretty strange. It isn’t a deep story, but it is an entertaining one for an entertaining game. As for the game itself, it is an on rails shooter like Star Fox. Through most of the game you’ll be dodging obstacles, and a lot of projectiles while you fire a seemingly endless barrage of fire. There are a wide variety of enemies too. Giant monsters, hundreds of soldiers, ships, tanks, and other vehicles. The best part of all of this is just how brisk, and smooth the game runs. 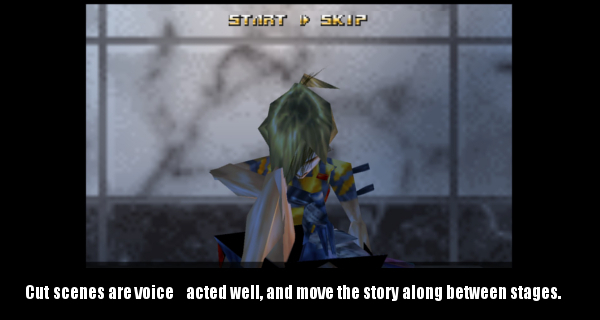 There are only a few moments of any slowdown during a play through. The Bosses are the main attraction in these kinds of games, and Sin & Punishment’s are definitely a big deal. Nearly every stage has a couple of boss fights. Just when you think you’ve conquered a level, you’ll find out you haven’t. Best of all,the game does this without it feeling like padding. In the end it feels like just about the right amount of time. Throughout the game you get to use three main attacks. There is a gun, that has two modes. A free aim mode that does higher damage, and a lock on mode. Locking on is almost like auto-aim in a first person shooter. It makes the game a little bit easier, but it also does a lot less damage to targets. The third attack is a melee attack. If an enemy gets too close, you can double tap the trigger to stab at them. Environments look pretty nice too when compared to most other games on the Nintendo 64. Textures seem a little bit better quality than in a number of other games, and there are a wider variety of settings. 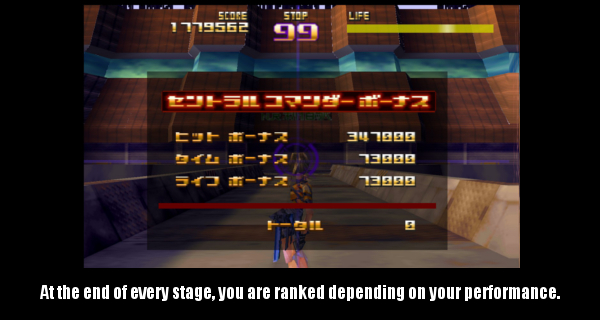 Each stage has its own particular settings, and themes. When you start the game you’re in wheat fields, with tree trunks. Soon you’re in a city. Then under the ocean, a military installation, and even space. While these are almost action game tropes, They’re all done with a unique flair. Some of the special effects are really cool too. There are great uses of colors, and translucent effects. The main drawback here though is that the models are fairly rudimentary. This was probably to keep the frame rate up to the speed the game play requires. Fortunately the wonderful texture work compensates a lot. It is definitely not an ugly game. Sin & Punishment also has some of the best sound on the console. 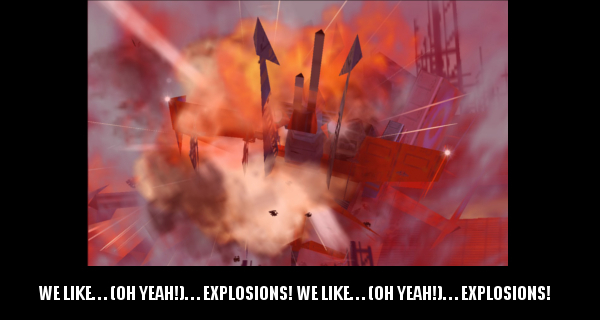 Voice samples come in pretty clear, explosions, lasers, and pretty much every other sound are great. The music even complements the action very well. It all blends together to make for a great experience. It isn’t a very long game either. If you’re really good you can beat it in a couple of hours. But rail shooters don’t generally lend themselves to long experiences either. They hearken back to the glory days of arcades, where shorter but more exhilarating experiences prevailed. They are also very difficult which this game certainly is. You can expect to die, and continue many, many times. Even on the easiest setting, you can find yourself running out of continues, and starting all over again. But again, such is the nature of this type of game. The high challenge will make the determined want to keep playing, and the really good trying to beat their time. If the thought of frustration turns you off it might not sound like your cup of tea. But most of the time the game is fair. Most importantly, the game is fun. 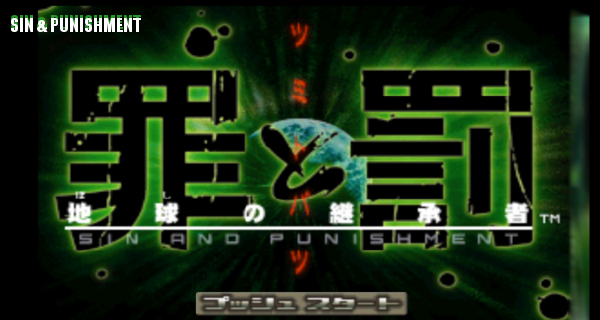 Sin & Punishment can certainly sound like an exclusive experience, intended only for fans of the genre. But don’t let that stop you from giving it a try. The strange story, characters, and dialogue are worth seeing, and they’re built upon a really good arcade shooter. Save for a couple of minor nitpicks over models, and a couple of cheap deaths it’s one of the best games in the Nintendo 64 library.